Once again – too often it seems – a massacre opened the news and grabbed headlines worldwide. The attack of a fanatic on two mosques in Christchurch, New Zealand, left almost 50 killed and many wounded. It was a mad rampage carefully planned and broadcast live on social media for the world to see and discuss. The fuel of these kind of acts is our attention and the perpetuation of it in time by the outrage for terrorism of any kind, poured by us on social media. Our comments and often polarized remarks prolongue the effect the terrorist had in mind. So, I for one am going to shut it down and extinguish the flame of hatred and bigotry this piece of provocation intended to stir. It won’t feed it with my energy. This entry was posted in Articles, in English, News and tagged attack, mosque, new zealend, Templars. The solitary Knight is often depicted in old chivalry tales as the perfect image of wisdom and valour. Indeed, each Knight and Dame of the Templar Order today should aim to live up to that expectation. But the Order becomes stronger when two or three meet in person and work towards our goals That is why the OSMTHU has long established the habit of adding to the already satisfying lunch or dinner event – a moment of friendship and joyful conviviality – a new moment of learning and sharing of ideas and experiences. And that moment is the Conference or Round Table. Friday was a peaceful day in Arraiolos. 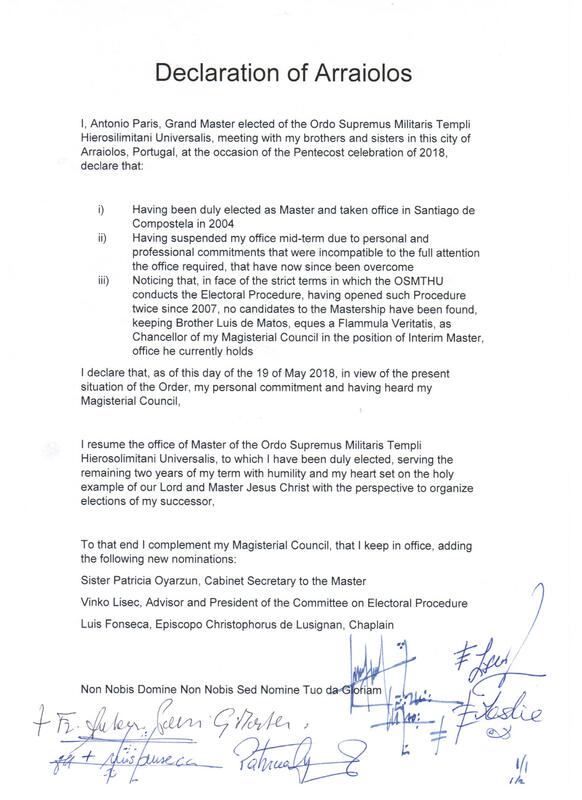 The beautiful village in the Portuguese region of Alentejo was the perfect setting to the Magisterial Council meeting Master Emeritus Antonio Paris promoted. But no rush. No worries. Life is taken lightly here in Alentejo. After everyone arrived at the Pousada of Nossa Senhora da Conceição, an old convent restored to it’s glory and opened to the public as an excellent hotel, it was time to find a place to have a light meal. Commander Rui herdadinha was already waiting, with a full afternoon of leisure in mind: typical local food, a walk to the Arraiolos castle, a stroll down the narrow streets of the village, famous for its rugs and tapestries. In the late afternoon the Council met, welcoming two of the visiting Order leaders so that the discussion could be broader and more informed. Master Paris lead the meeting, in which he announced his intention of resuming his Office (see the news and details here), working for unity in the Templar world. Fr+ Luis de Matos, Chancellor and Interim Master and Fr+ Leslie Payne, Seneschal were also present, with invited guests Sister Patricia Oyarzun and Fr+ Vinko Lisec, Prior of Croatia. The discussions were extensive and working plans for the next two years were laid out and analysed. That day the Declaration of Arraiolos was drafted, to be signed in the following days. Masterly organized by Commander Rui Herdadinha, with the precious help of Fr+ Filipe Beja, Director at the Pousada, the Gala Lunch was a great opportunity for Templars from all over Portugal and members of foreign delegations to meet each other, exchange views and experiences, talk about their templar projects and ambitions (we’re involved in projects such as the Portuguese Templar Santiago Way, the Feytorias Project, a research project, of which more will be known shortly) and generally having a great time. Present at the Lunch was the full leadership of the Portuguese Order, including Fr+ Luis de Matos, Prior General, Fr+ Luis Fonseca, Commander of Lisbon and In Ecclesia Bishop Christophorus de Lusignan, Fr+ Paulo Valente, Commander of Sintra, Fr+ Victor Varela Martins, Commander of Laccobriga, Fr+ Rui Herdadinha, Commander of Arraiolos and Sister Paula Valente, Preceptor of Porto, as well as Novices, Squires, Knights and Dames of the Priory. Visiting delegations were composed by Master Antonio Paris, Fr+ Leslie Payne, Seneschal and Grand Prior of England and Wales, Fr+ Vinko Lisec, Grand Prior of Croatia with Fr+ Lovro Tomasinec and Sister Paricia Oyarzun, currently Cabinet Secretary to the Council. Finally, the Lunch was further honoured by the presence of Fr+ Antonio Andrade, Prior General of Portugal of the OSMTH and his Chancellor Fr+ Fernando Castelo Branco. The opening session of the Conference took place in the Arraiolos Library on Friday night, with the presence of a representative of the local Municipality authority, the speakers and Commander Rui Herdadinha. On Saturday the main session opened at 3pm, under the general theme “Conflict and War- The Concept of Just War in the 21st Century”. Messages were sent by Priorires and Templar authorities that were not able to be present, from all over the world. These messages were read and will be added to the Proceedings in order to be published later in the year as a compilation book on the subject. The Commander opened the session thanking all those who contributed with papers and messages to the Conference, introducing Master Paris who reminded everyone of the history of the Just War concept, including the contribution of Saint Agustin and Saint Ignatius. Fr+ João Pedro Silva talked about Spiritual Chivalry, bringing up some of the main tenants of the Order, followed by Fr+ Luis Fonseca, Commander of Lisbon who read a passage from the “City of God” by Saint Agustin, commenting on it. Finally Fr+ Vinko Lisec, with the aid of Fr+ Lovro Tomasinec on the translation, told about his personal experience of war, reminding everyone that Croatia was torn between conflicting armies just a few years ago, when Yugoslavia broke apart. His account of the current refugee situation in his country, as well as of the disappearance of a national citizen in Egypt, kidnapped and used as ransom bargain by extremist groups, threatened to be beheaded in a video and since in an unknown location, had everyone gripped. The session was brought to a close at the end of the afternoon. After a short visit that the Library of Arraiolos merited, as one of the oldest public buildings in town, having served as the Mala Posta (old Royal Postal Service of Portugal), it was time for group photos. Some of the attendees then rushed to nearby coffee shops and terraces to get some water or a cold beer that would help to bring solace to a hot sunny afternoon in Alentejo. Others formed smaller groups debating the theme of the day and preparing for the evening’s ceremonies. After all, in less that one hour, the National Chapter was due to open in the Convent. This entry was posted in Articles, Calendar Addition, Events, in English, Investiture, Magisterial Council, News, Portugal and tagged Knights Templar, Magisterial Council, osmth, osmthu, osmtj, Templars. As “Jornadas Templárias para o Conhecimento Ecuménico” decorreram nos passados dias 13, 14 e 15 de Abril/2018, em Lagos, no Algarve. A – Integrando um conjunto de actividades, constituindo-se de uma “Feira de Cultura Regional”, com área expositiva da Ordem dos Templários, feira-do-livro, artesanato, doçaria regional e conventual; que decorreu no Armazém Regimental nos dias 13, 14 e 15. B – Assim como, no dia 14, sábado, realizaram-se as Jornadas do Conhecimento propriamente ditas, no Auditório do Edifício da Câmara Municipal – Lagos Séc.XXI, entre as 09:30 e as 18:30, com um conjunto de palestras, por Dignitários convidados, que abordaram o tema proposto na perspectiva da corrente doutrinária, filosófica, sociológica, espiritual ou religiosa que professada por cada um dos ilustres convidados. Cada prelecção durou até 40 minutos, em que o orador respectivo expôs a sua comunicação dentro do Tema escolhido para este Ano – Esperança e Caridade. As comunicações não foram sujeitas a período de perguntas nem a contraditório, procurando-se a construção de um Conhecimento Ecuménico, pelo reconhecimento e aceitação da diferença, a partilha de realidades, a abertura pelo entendimento a diferentes Verdades. A abertura dos trabalhos decorreu com uma actuação musical, pelo Grupo Coral de Lagos, com trechos medievais dos Séc. XIV e XV. As Jornadas Templárias tiveram entrada livre a Toda a Comunidade e Organizações. Todos foram muito bem-vindos. A Organização esteve a cargo da Comenda de Laccobriga e contou com o alto-patrocínio da OSMTHU – Priorado Ibérico da Ordem do Templo, o apoio da Associação Lagoriente – Al-Gharb, da Associação Grupo Coral de Lagos, do Exército Português, da Junta de Freguesia de São Gonçalo de Lagos e da Câmara Municipal de Lagos, assim como o apoio de diversas Organizações da Sociedade Civil nacional. 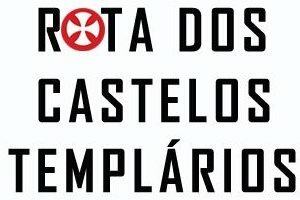 Objectiva-se a elaboração de um resumo das comunicações das Jornadas, bem como a elaboração da Acta das Jornadas Templárias, com o objectivo final de publicação deste conhecimento e a divulgação do mesmo junto de diversos Organismos da Sociedade, assim como a sua difusão dentro da Ordem do Templo. Igreja Católica Romana, Maçonaria Regular, Judaismo, Peregrinos de Santiago, Entidades de Solidariedade Social, Templários e Investigadores Académicos. Considerando-se que este é um tema central, quer no ternário das virtudes teologais: Fé, Esperança e Caridade; quer na constelação mítica e histórica da identidade portuguesa; eis então o motivo primeiro da escolha do tema para esta primeira edição das Jornadas Templárias para o Conhecimento Ecuménico. Pelo que a Comenda de Laccobriga da OSMTHU deseja, desta forma, poder inculcar a semente em Todos aqueles que, durante este dia, buscaram o conhecimento ecuménico, a aceitação e a partilha, caminhando para um mundo melhor, mais fraterno, de paz, em que os valores crísticos sejam a bandeira que possamos elevar bem alto. C – No dia 15, domingo, pela manhã, decorreu uma cerimónia solene, interna à Ordem mas aberta a todos os Irmãos de todos os Ramos Templários; chamamento que, de forma fraternal, teve eco e que, nesta celebração eucarística da Igreja Joanita Templária, a Egrégora saiu reforçada, os Irmãos preencheram os seus corações e cumprimos mais uma etapa deste Caminho para a missão a que nos haviam incumbido. Arrolamos aqui também, outra trindade, entre o Infante Henrique de Sagres, el-Rei Dom Sebastião e a Rainha Santa Isabel de Portugal. Ainda que vindos por caminhos diferentes, encontrar-se-iam ao centro, fundindo, num só, dois aspectos complementares da espiritualidade portuguesa. Pelo caminho de Sebastião vinha a esperança no resgate espiritual e temporal do povo português. Pelo de Isabel, a universalidade do amor, aspecto central no impulso da dádiva e da caridade. Teríamos, então, a Esperança e a Caridade. E, de Henrique, o Navegador, temos esta bela terra de Laccobriga, capital de antanho do Reino do Algarve, sede deste caminho para Ocidente em busca do Oriente, herdeira do entreposto marítimo na demanda da Jerusalém. Resta-nos, agradecendo a participação de todos, a Todos convidar e vincular para as segundas Jornadas Templárias para o Conhecimento Ecuménico, a realizar em 2019, em Lagos. Juntai-vos a Nós neste desígnio que a Todos nos envolve. A Todos Vós, meus irmãos, Boas Jornadas. + Dr Jaime Ramos, Presidente da Fundação A.D.F.P. + Dr Luis Fonseca, Deputado Mestre em Portugal do G:.P:.R:.D:.H:. This entry was posted in Akademy, Articles, em Português, Events, History, News, Portugal and tagged Algarve, Knights Templar, Lagos, Templars, Templários. Come and celebrate Pentecost in a Templar way. The 18 – 20 May 2018 the Priory of Portugal will host a three day event that includes Conferences, Debates and a full Adoubement Ceremony with Vigil and Pentecost Benedictio Militia. Templars from any branch of the Order are invited. Most activities (except the Vigil and short private section of the ceremony) are opened to the public, subject to pre-registration. All are welcome. More details (place, times, registration, etc.) upon request. Q: Who is the OSMTHU? Q: Is this the Templar Order of the Middle Ages or a (the) right descendant lineage of that Order? A: No. There is no such thing. The history of the Templars is fascinating, but one thing is sure: after over 900 years of its foundation and 700 years after its suspension, no single group can make such a claim with any degree of truth. There were pockets of survival at the time and we do study what became of the Order and its project across Europe, but any claim of continuity from any group should be regarded with extreme caution. Q: So, why are you using the Order’s name and symbols? A: For the same reason that we still have the Olympics today. For the same reason modern Universities, Academies and other Institutions draw on their Greek and Roman predecessors: the spirit is alive and the values they stood for are still valid and very much in need in today’s world. There is no linear historical flow, but the spiritual connection and ideals can be mastered and put to use. Our Order has been doing so for over 200 years and our branch for over half a century. It’s not likely we’ll stop now! Q: Is this connected with Freemasonry? A: No. Freemasonry is a fraternal Order that has no direct link to the 1804 revival of the Templar Order by Palaprat. Q: I have joined the Templars in a branch different from yours. Can I attend the event? A: Yes. 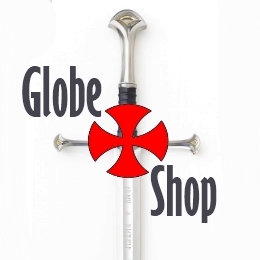 We accept Registration to the Event by every Knight or Dame that can attest affiliation to a Templar inspired Order, such as OSMTJ, OSMTH, OCMTJ, OSTI, OCE, OVDT, CBCS, KT, OSMA, etc. Q: But I am not active at the moment. Can I still attend? A: Once Chivalry is duly transmitted, it remains active in oneself if the values are kept. We don’t want to know about current membership status in any Order. Membership is a private matter for each individual. We only need to validate that Chivalry was transmitted so that we can open the access to the private part of the ceremony to those who wish to attend it. Q: I am not a member of any Templar Order. Can I attend? A: The general public can Register and attend the Event. The only exception is part of the Vigil (that starts around 9pm on Saturday and ends around 8am the next morning). New Knights and Dames need to be secluded and in silence and meditation during that period. The ceremony ends with the doors of the church opened to the public and the celebration of Mass and Eucharist at 9am on Sunday. Q: Apart from the Ceremony, what else will take place? A: There will be a Conference and Debate on Friday night and Saturday afternoon, with several guests speaking on “Conflict and the Notion of the Just War”. There will be a Gala Lunch on Saturday where attendees, members and invited guests, will network and get to know each other. The start of the Vigil, around 6pm and up to 9pm will take place in the church and will be opened to the public. Doors close at 9pm and only Knights and Dames may remain then. Doors will reopen at 9am on Sunday allowing the public to witness the completion of the Ceremony and Mass. In all, there are three days of conferences, debates, talks and ceremonies. Q: I’m not a member of a Templar Order. Can I become a Knight (or Dame) during the Event? A: No. The Pentecost Benedictio Militis is a ceremony that closes a cycle that was opened when the members that are going to be Knighted were received as Novices quite a while ago. The Order is not accepting novices during Pentecost. Q: Where will the Event take place? A: It will take place In the country of Portugal, in a small medieval village relatively close to the capital, Lisbon. Q: Why don’t you disclose the location? A: To avoid unwanted attention in a very special spiritual occasion, the location is only disclosed to Registered participants. The Event will take place in a village conveniently accessible from the main Portuguese airport, featuring good accommodation and historically rich surroundings. Q: What language will be used during the Event? 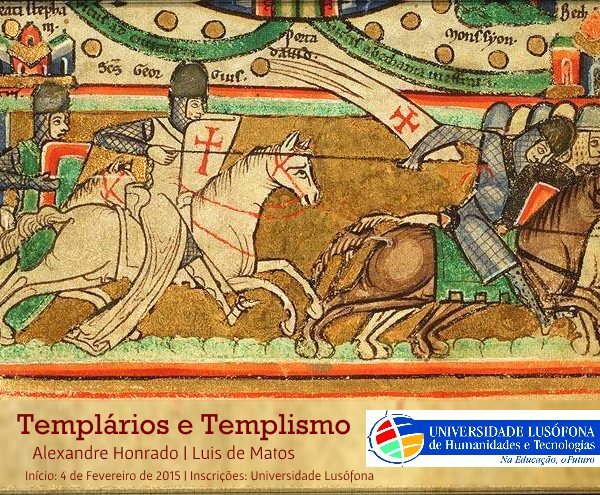 This entry was posted in Calendar Addition, Investiture, Magisterial Council, News, Portugal, Templar Sites and tagged Templars.